1. Remove accumulation of dirt and grease. 2. Spray or wipe on a uniform coating. 3. Apply heavier coat to areas where corrosion is present. 4. Reapply after any solvent cleaning, contact with chemicals/acids or when metal surface has been severely damaged by abrasions. Corrosion is the gradual destruction of metals by chemical reaction with their environment. Prevention is almost impossible, but can be controlled. Corrosion engineering, pinpoints types of corrosive attacks which can cover an entire surface or penetrate by forming pits. Corrosion attacks may follow grain boundaries on metallic surfaces or may penetrate a painted surface to travel at random. While there are standard classifications for identifying the cause of corrosion, oxidation and pitting are among the most popular. 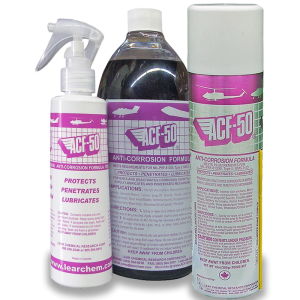 ACF-50 Anti-Corrosion Lubricant was designed with corrosion control properties that protect both the air frame and avionics systems. Its ultra-thin fluid formula acts like an “OFF SWITCH” for corrosion. Therefore it actively penetrates and “creeps” into the tightest seams, lap joints, small cracks, and around rivet heads. Resulting in a non-greasy, atmospheric barrier to protect metal. Meaning, it protects against common electrolytes like toilet fluids, acids, road salt, soft drinks, OJ, and coffee. Regular treatments with ACF-50 reduce maintenance and repair costs, resulting in improved overall safety and readiness. ACF-50 is also ideal for use on motorcycles, cars, trucks, and power sports vehicles and equipment. Keep in mind: When using any NUVITE product, please refer to appropriate procedures and recommendations for use and equipment, or contact a NUVITE technician for more information, unique applications and special requirements. *Product dilutions are determined by extent, condition & soil type.